Surrounding central Ulaanbaatar's steel and glass office buildings, the several generations of impregnable Soviet apartment buildings, and the new block-brick-and-stucco apartments are what are known here as ger districts or sometimes ger areas. On a city map they are drawn in the palest gray, just slightly darker than the paper-white irregular passageways marking the dirt connections between them, hinting that there is nothing of importance to see there. There are ger districts in every city and town in Mongolia. Just counting those here in Ulaanbaatar, which are home to a third of all Mongolians, living in these areas is more Mongolian than riding horses or playing the morin khuur. Given the number of small houses that have been built in these areas, their defining characteristic is no longer the actual gers, but the set of living conditions that these residents share. Rich or poor, they must bring their own water to their house. They use outdoor pit toilets. Until very recent monthly public garbage pickups, waste was simply thrown into vacant lots or ditches—and still often is. And in these huge tracts of tightly packed residences, each individual dwelling burns coal, the cheap and locally available alternative to dung or wood. In the context of a rural nomadic herding society on sparsely populated land, these are practices that made practical sense. In an urban context, multiplied by the thousand, each single dwelling adds to the difficulty of addressing the environmental and health issues the city now faces. The most noticeable, especially in the winter, is air pollution that comes largely from the thousands of individual coal stoves, a problem that won't go away until a viable alternative is available. But underground thousands of pit toilets seep into the water table, as do oil changes and other toxic waste that is dumped into ditches. Garbage dumped randomly supports a large population of feral dogs. Because there has been no planning (or at least visible action) to provide for basic utilities, it has become overwhelmingly difficult to retrofit these areas with the services available in the central city. Most comprehensive plans have simply advocated moving residents somewhere else, vacating the land, and wiping it clean for a fresh start. Needless to say, there is resistance from ger district residents to this kind of solution. In addition to the fresh start promised for the land, entire economic networks would be erased. In December, I went on a Ger Area Tour of a few locations in the northeast, Bayan Zuurkh, and north, Chingeltei districts. We visited a tailor, making traditional Mongolian deels; a former waste dump converted to public green space by residents; a former quarry that has been turned into a commercial park and skating rink; and the only fresh water spring providing (free) water to residents in Ulaanbaatar. Everywhere else water is sold by the liter at public water stations, dispensed into buckets, cans, or plastic jugs either carried or wheeled home, a few gallons at a time. What was clear was that the ger district is not the same as what we know as a slum. There is poverty here, but also those who are solidly middle class, earning a living that allows them to build a comfortable house. Regardless of money though, they cannot buy what can only be paid for collectively—sewer and water services, paved roads, public utilities for heating their individual homes. Although I've been told that nobody who lives in a ger would do so if they could afford to live in an apartment, I've heard others say that they prefer living on their own plot of ground, in a detached dwelling where they can control their own heat. Starting with a ger, they can build as money and time become available. Certainly there is an element of individuality that is expressed on gates, fences and buildings within hashas that would be familiar on the more rural outskirts of many US towns or cities, especially in the west. 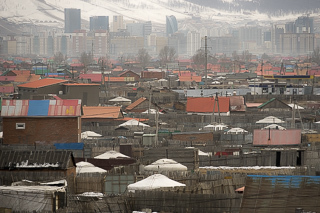 At the fringes of these cities, as here in Ulaanbaatar, those on the very outer edge still manage to keep animals or plant a small garden where there is water, signs of a predisposition toward self-reliance and independence incompatible with apartment living, but not necessarily with public services and utilities if they were available. Twenty-six years into independence, Mongolia is a sandbox for testing the principles of smaller government, fewer and weaker regulations, and greater influence of private money on public decisions. When the Soviets left in 1990, Mongolians were left with a clean slate on which to define their new government, interpreting the principles of freedom, democracy, and capitalism from scratch. Though modeled on successful democracies, in this version, freedom has come to mean a lack of restrictions on self-serving behavior; democracy allows citizens to vote for politicians whose main interest is power and money; capitalism is an acceptable rationale for putting your own interests before those of anyone else. The results are worth pondering. In the United States a very significant proportion of voters have decided to despise our government, to abhor regulation, to attempt to alter the results of elections by using money and elected position—even to alter the rules governing elections—short-circuiting democracy with greed and ill-advised power. We have abandoned what was once known as the common good as an expense we'd rather not be burdened with, handed the reigns to those with contempt for government, whose expectations of government are personal instead of public. After two hundred and forty years of progress, we are choosing to emulate Mongolia. Here is how that plan is working for the majority of those in Ulaanbaatar. 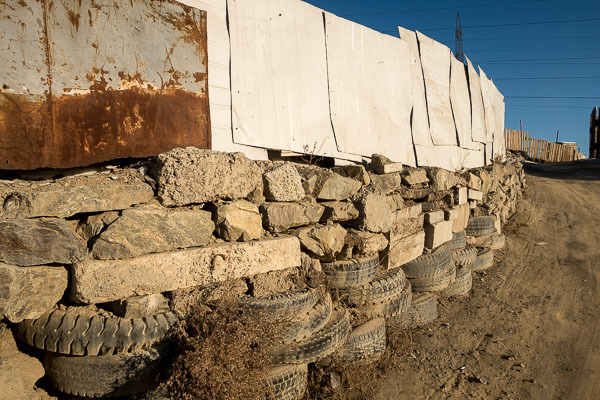 Used sheet metal, used concrete, used tires make a secure fence.